Cassia Cassitas is a Brazilian author of four books. 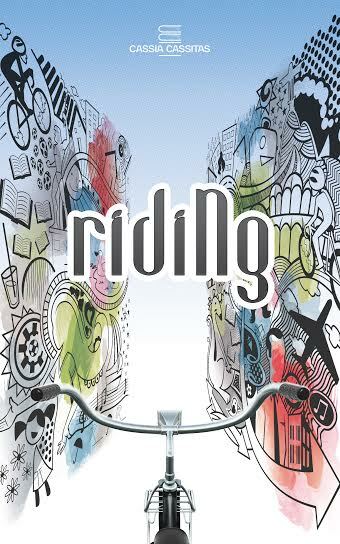 Her latest - Riding - was just released this spring on Amazon. She made her career in technology and has remained in academics both as a teacher and a student, working on innovative projects. A mother to two adolescents, she published her first work, Sunday, The Game, in 2010. It was a digital best seller in Brazil. I hope you enjoy this intimate Q and A with the author as much as I did. And be sure and check out my book review of her current release Riding which also includes links to connect with the author and to purchase. Just click HERE! I was born in Arapongas, a small town in south of Brazil. During summer vacations, I actually went to the Public Library to borrow books. It was quite far and the time walking gave me the opportunity to think and dream. I was a dreamer reading old books. It made me to write about almost everything since childhood. I have books and notes everywhere. I read every day – literature is a window that enlarges my world, proposes alternatives and insinuates paths. In this search, writing was natural, a manner of counterargumentation, discussing and fiddling until the birth of the text. I delayed the publication of my first book since adolescence until, with grown sons and my life practically resolved, I decided that it was time to move on. My first book was published in 2010. Where do you find inspiration for your storylines? The characters you create? From questions that magnetize society, mobilize people. By coexisting with groups of different interests and formations, I notice some themes are atemporal, are present for everyone with different connotations. My characters are born to reproduce the convergence that unites us and the diversity that divides us. I like setting them in Brazil in scenarios rarely explored. My first book, Sunday the Game, addresses familial relations during a family lunch. In Saga of Wealth, Brasil under the impact of the American bubble in 2008 is the setting of the relationship of people with money. In Riding, relations defy life, and the world spins following the rhythm of sports. The narratives are short, human, and strong as an athlete. The opening chapter for Riding is very usual - almost a dream sequence. Can you share a bit about the meaning of this opening and what it's importance is to setting up the story that follows? Despite showing the world through the eyes of a cyclist, Riding is a book to be read with all senses. In “Shards” there are ruptures and new beginnings. “Looking at the parts,” the reader is invited to select possibilities and paddle in its direction. The chapter connects all elements approaching and leaving as life does. After reading “Shards,” the reader does not expect a cycling guide, because he knows Riding is about human beings seeking happier existences. Riding is set in cities around the globe. Have you travelled to all these places? If not, what type of research did you have to do to make them come alive? Not all of them. I did virtual trips by reading a lot, watching videos and movies, using digital tools. I needed to see the landscape with my own eyes to perceive the setting, unravel behaviors to only then portray the whole scenery. How did you learn so much about the preparations going on years ahead of time at the many Olympics that are a part of the story line? The big question in my mind was: “Where does the sparkle in someone’s eyes actually come from?” “How do smiles brighten up someone’s face?” “How can hope get to someone’s heart?” “What makes someone wake up and feel happy to move about?” Looking for answers, I went to sports. Talking with people, watching competitions, hearing their tales impressed me. I wanted to know more. Everything started in Seoul. Each topic was planned. Then, I prioritized the social aspect, intertwining the facts that occurred with the characters’ activities. I read interviews and handed them to Mario during the hard negotiations in Atlanta. He brought up the social conflicts of society. I got striking events from the years preceding the realization of the events, and Greenpeace won the pages of preparation in the Sydney games. Evaluating legacies, Barcelona was reborn and gave birth to the boy who pedaled. He carried in his name the mythical heritage of the millennial party that gave chronology to the book to course a path of glory surpassing open wounds. Emotion led to the study that led to the enchantment. The result is here. Cycling is such an intrinsic part of this story. Do you love to bicycle? I learned to cycle at 25. Curitiba inaugurated kilometers of cycling paths connecting neighborhoods and parks. Everyone pedaled, I wanted to learn and participate. My character André was growing and needed a passion. Why not entangle André in the family tree of this city that revealed so many cyclists in championships throughout the world? Besides, Elizabeth, his mother, raises the flag of social inclusion through sport. Education and maternity united in the mission of providing a future deserving of dignity to the small ones. It had to be a bike! Accessible, non-polluting and efficient. Without mentioning the beauty of living with the wind on our faces. While the years of preparation leading up to the Olympics and competitive cycling provide the framework for the storyline, Riding really is more about life, relationships, challenges, etc. What is the one most important thing you hope readers take away from this book?